Put your best forward when heading into an important meeting, a social event, or a family gathering. With just one spray of the Nivea Body Deodorizer Fresh Lily & Sandal for women, enjoy a fresh, floral scent that's long-lasting in effect, and in impression. 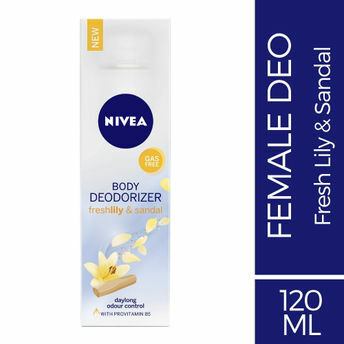 Setting it apart from rest, the Nivea Deodorizer comes with an innovative gas-free deodorising formula which is concentrated, yet skin-friendly. Unlike other deodorants, it not only creates a refreshingly floral fragrance, but also controls the formation of body odour with a single use. Additional Information: A brand trusted universally, Nivea is a leading international skin care company that brings to you innovative skin care and cosmetic products. Nivea understands skin like no one and they are known for their specially formulated skin products for different skin types, that cleanse, nourish and protects the skin while keeping it radiant and beautiful.